Peter Wright sits in eighth place in the league table but can leapfrog seventh-placed Simon Whitlock with a victory in this encounter; a seventh place finish would give Wright £5,000 more in prize money than finishing in eighth position. Snakebite suffered his fourth 7-1 defeat of the campaign when losing to Michael Smith in Manchester last Thursday evening. The reversal against Smith was only his second defeat in his last seven Premier League matches, though he has only won two of his last 12 fixtures in the competition. Wright lost in the early stages in both of the Players Championship tournaments that were played last weekend. He was defeated in the third round on Saturday by Simon Stevenson and on Sunday in the second round he was ousted by Gabriel Clemens. Simon Whitlock earned a shock 7-5 win against Gary Anderson last time out after the Scotsman missed a dart at double to salvage a draw. Whitlock went into the match on the back of a four-match losing streak and the victory was only his second Premier League win in his last 11 matches. Although Whitlock’s play-off hopes are over he can still finish at high as fifth in the table; the difference in prize money between finishing seventh and fifth is £15,000 so he still has motivation to pick up points. Whitlock has won two and drawn one of his last four matches against Peter Wright. When they met earlier in this season’s Premier League, they drew 6-6 with Whitlock having led 6-3. Both of these players are out of the play-off picture so are playing for pride as well as the difference in prize money between the lower positions in the league table. As you would expect for two players who are in the lower reaches of the table, their form hasn’t been good, though they have both recorded notable wins recently - Wright defeated Van Gerwen and Whitlock defeated Anderson – those wins are rare high points in their campaigns however. 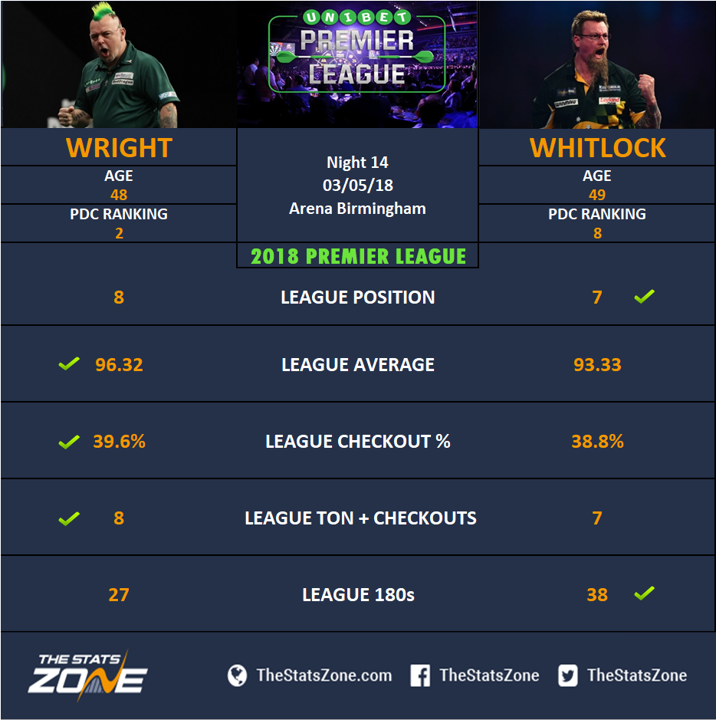 Wright’s ranking and consistency over the last few years mean he comes into this match as the favourite but he has been below his best too often in this year’s Premier League to be confident that he will play to the levels he is capable of. Whitlock will be feeling much more confident for having defeated Gary Anderson last week but it’s hard to assess if he can build on that result. Wright and Whitlock shared the points when they met earlier in the season and this match could bring the same outcome.